Our Mana Shoreline Waling Safaris are for 3 nights starting on Mondays, Tuesdays, Fridays and Saturdays. To be able to walk on the first day, guests are required to arrive into Mana no later than 11:30am. Guests may choose to combine this safari with a night at our Camp Zambezi to ensure timely arrival. 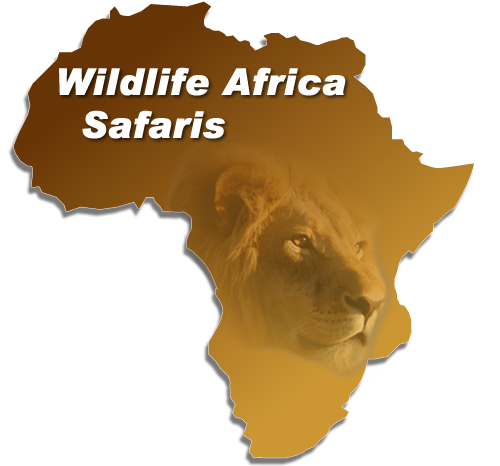 A fully licensed-armed Professional Guide, who is permitted to conduct walking safaris, leads each safari. The following information is a generalised itinerary and can change at the guide’s discretion, due to animal movements and/or river conditions, so as to optimize the safari experience. After being collected by your guide you are driven to the first nights camp, a distance of approximately 30km. 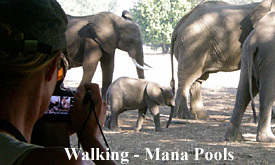 This is a leisurely game drive through the spectacular Mana Pools floodplain. The vehicles are open with good all round views. The highest concentrations of wildlife in Zimbabwe are in this area and the drive through is usually very productive, allowing your guide to give you an overview of the various animals, birds and plants that make up this unique habitat. On arrival at Vundu, the first camp, you will be met with the welcome smiles of our support staff and a lunch of cold meats, a variety of salads and freshly baked breads. After a refreshing lunch break you will be taken on a short drive to the start of your walking safari near the confluence of the Ruckomechi and Zambezi Rivers where the professional guide give a full safety briefing include pointing out where all the equipment is kept, such as first aid kits, as well as explaining what to do in the case of an emergency. This is a slow walk allowing time to become accustomed to the area. You should also start to see some of the multitude of animals and birds that are attracted to the water’s edge. 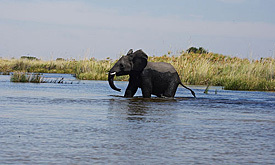 Hippo, buffalo, elephant and crocodile as well as a variety of antelope species may be seen. Arrival at camp is around sunset. The camp will be prepared for you arrival so you will be able to sit back and relax with sundowners and snacks – tea and coffee and hot showers are also available. Invariably guests will gather to discuss the day’s events around the campfire and plan for the morning. In the background your support staff and resident cook are busy preparing a threecourse dinner for you. An early wake up, just as the dawn breaks. Hot water is placed in raised basins outside each tent, while tea, coffee, muffins or home made biscuits are already waiting by the campfire. While everyone gets their personal kit together the support staff get everything together that will be needed for the day. You need only worry about a small daypack carrying the essentials such as sun block, camera and spare film, hat and binoculars. The aim is to be walking in time to watch the sunrise. This is one of the most magical times of the day and you will be enchanted as you drift along quietly, listening to the sounds of the African bush wakening to a new day. Walk for a couple of hours before stopping to breakfast under a grove of acacia trees. After breakfast set off on a walk into the floodplains and surrounding woodlands. This is a great time to try and catch some of the predators before they hide up for the day. You may even be lucky enough to spot one or more of the diurnal animals making their way down to the river. This walk offers an opportunity, not only for game viewing, but also a chance for you to explore some of the smaller more interesting aspects of the environment. You will spot a variety of animal spoors, and may even find yourselves engrossed in tracking down a particular species. Strange insects and spiders will fascinate you as your guides share a wealth of knowledge about this miniature world that forms such an integral part of the bush. You will listen to the sound of the many brightly colored birds and marvel at the beauty and tranquility of this unique area. You can choose to either continue walking or call the backup vehicle to come and collect you – this afternoon consists of a lovely lunch and then a siesta. Once again you will walk into Chessa, the next fully set up camp, where our staff are ready to welcome you back. This follows the same basic itinerary as day two, with a predawn wake up and sunrise. However, this is the day that you will enter the “Wilderness Area” of Mana Pools National Park where there is limited access to people and vehicles. From here on it is a much more remote environment with very few people. 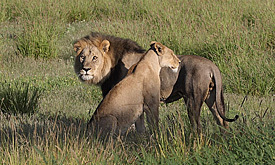 Breakfast may be taken on the Mbera River floodplain, which comprises stunning acacia woodland with large patches of thick “Adrenaline” grass – a habitat much favoured by all the predators. Towards the end of the dry season it also hosts large groups of female elephants with their babies. This afternoon is as per day two. This night’s camp is called Ilala. Depending on your departure time, or if you are moving on to an alternative camp, you may either take another early walk before breakfast or have a lie in! After that, there will be a short game drive to the airstrip or Nyamepi, Mana Main Camp where we bid you farewell! As you depart with your memories, we know that this experience will have enriched your life and touched your soul!